EL MONTE – Durfee School first-graders Jazmin Benitez Ramos and Ella Galdamez-Terriquez said their school’s Spanish dual-immersion program is great for learning and sharing new words – including Galdamez-Terriquez’s favorite word: “florecita,” which means little flower. Durfee School’s Spanish dual-immersion program, which has been available for two years, promotes bilingualism, biliteracy and cultural understanding for 82 students in two kindergarten and two first-grade classes. 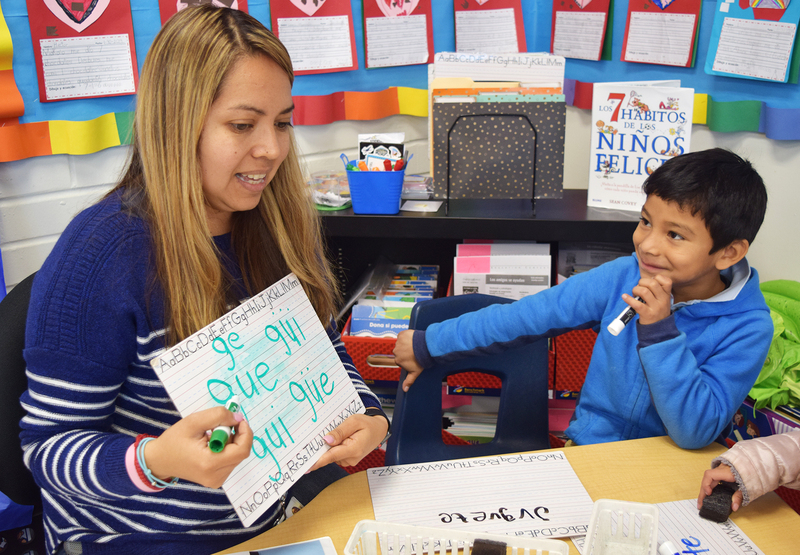 The program begins with a 90:10 Spanish-to-English instruction model, then decreases Spanish instruction until reaching a 50:50 balance in fifth grade. 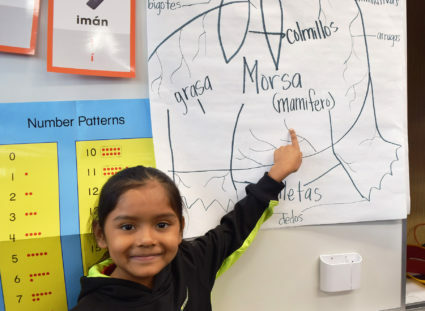 “This program is teaching students to be more tolerant to different cultures because they’re learning so much and becoming accepting of other people, cultures and ideas,” first-grade dual-immersion teacher Maritza Duenas said. Kindergarten dual-immersion teacher Yolanda Espinoza said the program improves the way students communicate since it teaches them twice the vocabulary to express themselves. EMCSD_BILINGUAL1: Durfee School first-grade dual-immersion teacher Maritza Duenas teaches the syllable “gue” to first-grader Andy Aguilar during a program lesson. EMCSD_BILINGUAL2: Durfee School first-grader Jazmin Benitez Ramos points to Spanish words used to describe a walrus.